The quick answer, it is my new book ($14.95 trade paperback, published by Cold Spring Press, ISBN 1593600119, press release here). Another, it is the reason why I haven't had very many new columns in the last several months. More accurately, it is a collection of many of the medieval writings that were important to Tolkien, given in modern translations, mostly into prose. For this column I thought I'd reproduce a few bits from the book to give a better idea of what the book is like. First comes a section from the "Foreword" by Professor Verlyn Flieger, followed by my "Introduction," and last a listing of the contents of the book. These are texts that Tolkien knew intimately, that he lived with, studied, taught, edited, translated, and absorbed into his imagination as a sponge absorbs water. That imagination transformed as well as taking in, so that the material, when it flowed out again onto the manuscript pages that became The Lord of the Rings, was no longer simply borrowings from medieval sources, but had been woven deep into the fabric of his own Middle-earth. It belonged there. This book is a feast of medieval narrative from all over the Northern European and British worlds, cooked up by authors known and unknown out of the plentiful ingredients of myth and legend and folktale, and beautifully served for the pleasure and enlightenment of the contemporary reader. 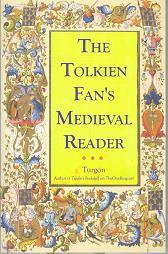 Over the years Tolkien's fondness for and indebtedness to medieval literature has often been mentioned. His special devotion to older Germanic literature, including Beowulf and the Eddas, has long been known, for as a professor he taught these works in addition to teaching the languages in which they were written. But the number of Tolkien's general readers who are themselves familiar with classics such as these seems much smaller than it might be. 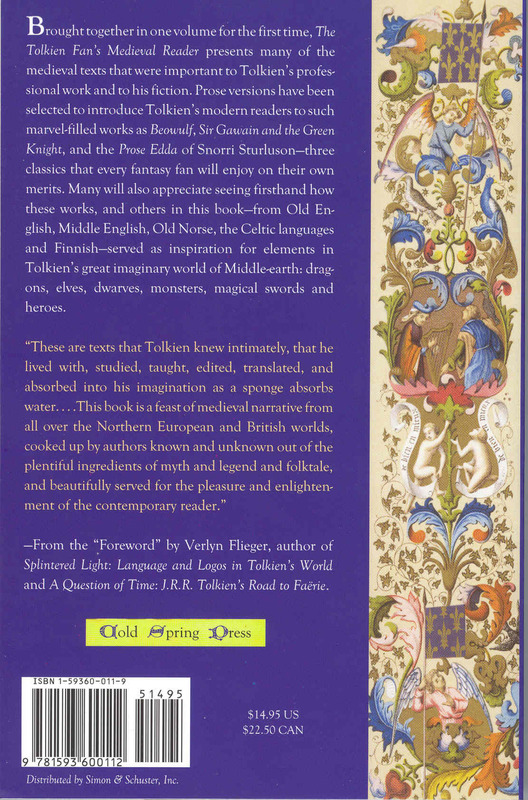 This anthology has been compiled in the hope of sharing the pleasures of these -- and other -- classics of medieval literature that were part of Tolkien's professional life and inspirations to him in his creative work. Tolkien taught at Leeds University in the north of England from 1920 through 1925, and at Oxford University from 1925 until his retirement in 1959. Over a teaching career spanning nearly forty years, he specialized in Old English, Middle English and Old Norse. This book presents selections in five major categories, the first three being the areas of Tolkien's professional expertise. The fourth section, Celtic, is a subject which Tolkien did not teach, but one in which he was certainly learned. So too with Finnish, the final category. All of the translations included in this anthology were taken from the public domain. For many works there were multiple translations to select from, and in each case I have chosen one that seemed to me the best and most readable translation. For the most part, I have also preferred prose versions, though nearly all of the selections chosen for the Old English and Middle English sections were originally written as verse. To readers being introduced for the first time, say, to the story of Sir Gawain and the Green Knight, the intricate Middle English verse forms, unfamiliar to modern readers, may be seen as a stumbling block, even in the excellent verse translation by Tolkien himself. As with Beowulf when it was recited in mead-halls a thousand years ago, it helps to know the basic story beforehand. Once the story itself is familiar, one can then better appreciate the way in which any particular poet chose to tell it. Each section is headed with a short introduction that discusses Tolkien's relation to the subject and to the particular works included in that section. The translations have been very slightly edited�that is to say, while nothing has been cut out, some of the more excessive archaisms have smoothed over and replaced with more modern terms, and some of the names have been regularized according to current norms and standards. This book is intended as an introduction to certain medieval works, not as an endpoint in itself. I encourage readers who appreciate these selections to seek out further translations, either ones more modern academically, or verse translations (like Tolkien's own) which reproduce the original form and meter. 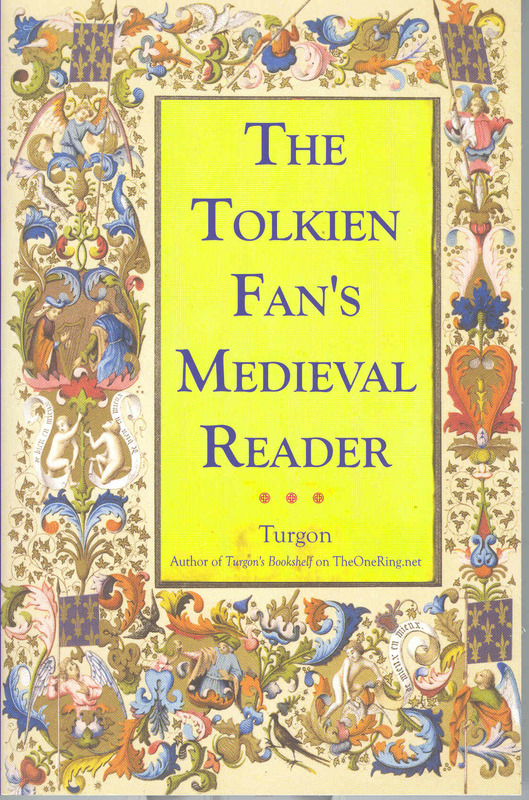 Recommendations for wider reading among medieval literature can be found in Tom Shippey's short essay "Tolkien's Sources: The True Tradition" (Appendix I, pp. 343-352) in his excellent study The Road to Middle-earth.